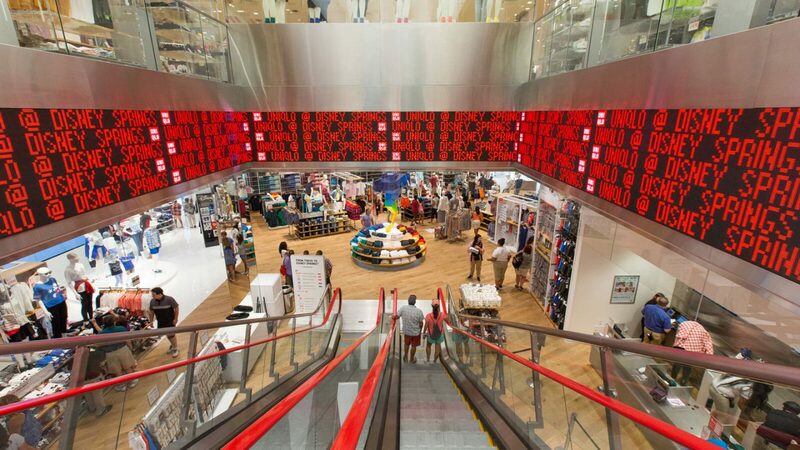 As Uniqlo, one of the largest retail brands in the world, looked to continue its expansion in the United States with its first store in Florida – the company hired Gable in 2015 to install a variety of dynamic digital displays including tickers and high-resolution video displays. Uniqlo, a global retailer with more than 1,400 stores in 16 markets worldwide, began working with Gable after the company first had the opportunity to see Gable’s visual solutions capabilities in person at GlobalShop in 2015. Realizing Gable has worked with some of the biggest retail brands in the world including Starbucks, Verizon and Macy’s, Uniqlo hired Gable to deliver a unique digital experience at its first Florida store in Disney Springs, Fla.
For Uniqlo’s first store in Florida, Gable installed an array of digital tickers and high-resolution digital displays that allowed the retailer to draw shoppers inside and throughout the store and provide a sense of drama and energy into the store atmosphere. On the store’s first floor, two 4mm high-resolution round tickers, each 1-foot tall with a circumference of 10-feet, grab the eyes of shoppers immediately. The largest ticker wraps around the store’s main escalator well, measuring 105-feet wide by 3-feet tall and offering 6mm resolution. Another 6mm ticker display, on the second floor of the store, measures 74-feet wide by 8-inches tall. Gable’s digital tickers offer more than traditional monochromatic tickers, providing Uniqlo a more functional solution that allows the location to loop its bright red logo or display videos for customers with messaging particular for the moment. Uniqlo also chose Gable for its high-resolution LED video displays. On the first floor, two 4.81mm video displays that each measure 6-and-a-half-feet wide by 13-feet tall grab the attention of shoppers walking outside. Compared to LCD displays used in other stores, the LED displays at Uniqlo in Disney Springs provide a vivid, vibrant picture, which is perfect to show off Uniqlo’s bright red logo. 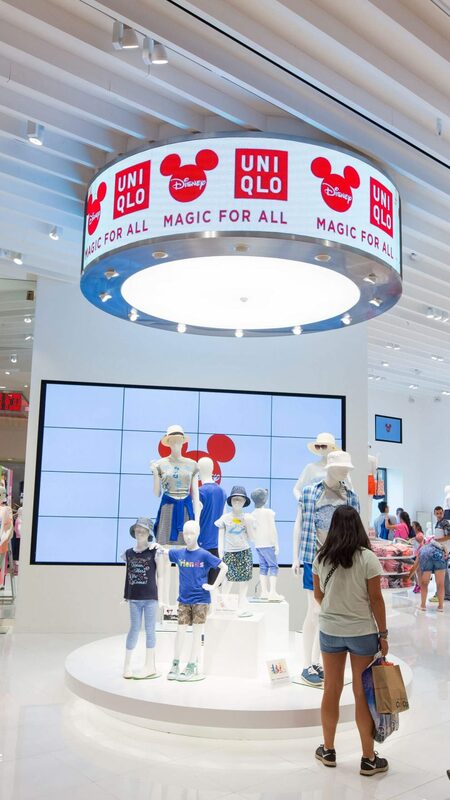 After Gable worked with Uniqlo to plan solutions specific for the store in Disney Springs, Gable needed just two weeks to install the digital technology inside Uniqlo’s Disney Springs location. The store held its grand opening on July 15, 2016. 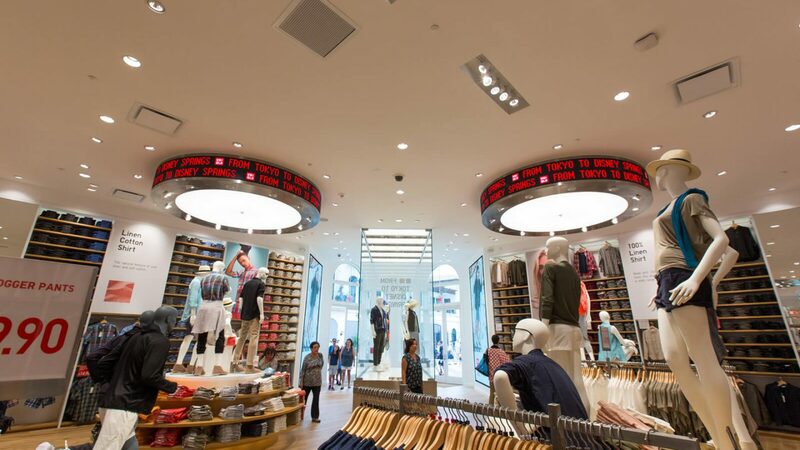 Today, Uniqlo’s Disney Springs store is outfitted with the best in digital technology and the solutions provided by Gable provide an experience that accomplishes what the global retailer was looking for. With video displays offering high-resolution picture that pops and versatile digital tickers throughout the store, Gable’s technology is offering shoppers a unique experience in Disney Springs that makes them want to stay longer and consider purchasing more. About Uniqlo: Uniqlo Co., Ltd. is a Japanese casual wear designer, manufacturer and retailer, with more than 1,400 stores in 16 markets worldwide. The company has been a wholly owned subsidiary of Fast Retailing Co., Ltd. since November 2005. In addition to Japan, the company operates in fourteen countries globally. For more information, visit www.uniqlo.com.